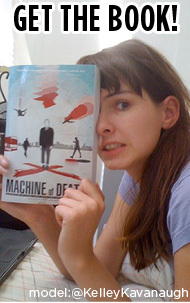 Machine of Death » Strange Horizons is giving away a hardcover! Strange Horizons is giving away a hardcover! Just a reminder that Strange Horizons, one of the best science-fiction magazines still publishing today, is giving away a hardcover edition of Machine of Death as part of their annual fund drive. This isn’t just any hardcover either: It’s one of only two known to exist that’s signed by all three of the editors! There are only two weeks remaining to support this very worthy, very excellent and totally non-profit science-fiction magazine. It’s my understanding that the staff at Strange Horizons are all volunteers and that donations are primarily used to fund paying writers and artists, and for the cost of keeping the site up and running. And since Strange Horizons was the first professional market to publish one of my stories (all the way back in 2003), it’s obvious that they have excellent taste and extraordinary foresight in picking the work they publish. Comments Off on Strange Horizons is giving away a hardcover!